Enjoy fast print speeds, professional-quality output, and flexible connectivity options with the easy-to-use, value-packed HP LaserJet P2035 Printer series. With this series you can get your documents and get back to work quickly with print speeds of up to 30 pages per minute (ppm) on letter size paper. Time To Completion for a typical office print job can be nearly two times faster with the Instant-on Technology built into this printer. Quickly connect the printer to your computer with the Hi-Speed USB 2.0 port. Share the printer and efficiently utilize resources with built-in Ethernet/Fast Ethernet networking on the P2035n model. Easily print a variety of black-and-white documents - including index cards and prescription-size forms - with support for a range of media sizes and types. Print professional office documents with up to 600 by 600 dpi thanks to Resolution Enhancement technology (REt). And because HP print cartridges and paper are designed together, you can depend on consistently excellent print quality. Save valuable desktop space and still enjoy convenient access to the printer with its sleek, space-saving design. Reduce operation noise with the printer's unique Quiet mode. 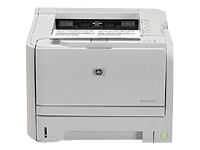 Enjoy at-a-glance printer and supplies status and easily navigate printer functions with the simple control panel. Maintain your printer more effectively and avoid unexpected down time. With HP SureSupply and intelligence built into the cartridge, you'll receive alerts when supplies are low, enabling convenient supplies shopping and ordering. Manage 2 to 20 HP inkjet and LaserJet devices, control color costs, and reorder Original HP supplies with HP Easy Printer Care Software. Produce a broad range of business documents with the right look and feel. The multipurpose tray supports a variety of print media, including different types, sizes, and weights of paper, envelopes, labels, overhead transparencies, postcards, card stock, and more. Replenish the paper tray less often with the 50-sheet multipurpose tray and 250-sheet standard input tray, for a 300-sheet total input capacity. The all-in-one print cartridge is designed for simplicity and reliability, incorporating the toner, engaging mechanism, and imaging drum in one supply - so you refresh the printer every time an Original HP cartridge is installed. Quickly and accurately process complex print jobs without the cost of buying additional memory using the host-based print driver, a 266 MHz processor, and 16 MB of memory.